Hello, my name is Ming and I’m a MoVida addict. So when MoVida opened their very own bakery on the other side of the river, I couldn’t get there fast enough. Unlike their other restaurants, which are tucked into the heart of the CBD, MoVida Bakery has much more of a neighbourhood cafe feel, with nothing revealing the genius of what’s going on inside. 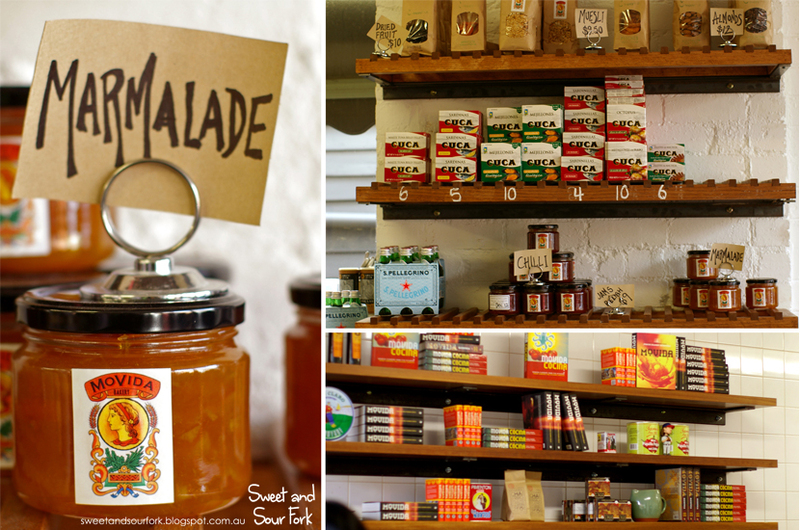 But step through the glass doors you’ll be treated with a thousand and one types of breads and pastries, house made jams, and shelves upon shelves of Spanish goodies so you can take some of the MoVida magic home with you. The eating area is split into two sections; a small front room with just a few spots facing the window, and a slightly larger back room with communal tables. The cafe is dwarfed by the kitchen however, which is entirely open, separated from the cafe by only a wall of flour sacks (organic of course). The whole bakery is treated to puffs of delicious smells every half hour or so, when a new batch of bread or pastry comes out of the oven. Chris’ Lamb Pie was encased in light, buttery pastry that showered flakes all over the cute little wooden board with every bite. The hearty chunks of lamb inside were soft from braising and delicately flavoured, and even the bottom of the pie managed to stay crispy. I would have liked a little more gravy in the pie, but the excellent pastry is sufficient compensation. Despite being a cold day, I couldn’t resist the fresh Salmon Sandwich. Between two dense but moist slices of bread were chunks of pink poached salmon, greenery in the form of dill and watercress, all held together by a tangy lemon aioli and sweet, crispy slices of pickled cucumber. This was a light sandwich that’s full of goodness, with flavours that are balanced and restrained, but definitely not bland. And despite being fairly small, it did an excellent job of filling me up. But we couldn’t leave without trying one of the famed Salted Caramel Donuts ($3.5). On the up side, the donut was generously dusted in cinnamon sugar and the gooey filling hit the perfect note of salty-sweet. Unfortunately the donut was stone cold, which made it rather dry and unappetising. Until they start keeping them in warmers, I think I’ll stick with the Hot Jam Donuts at Vic Market. 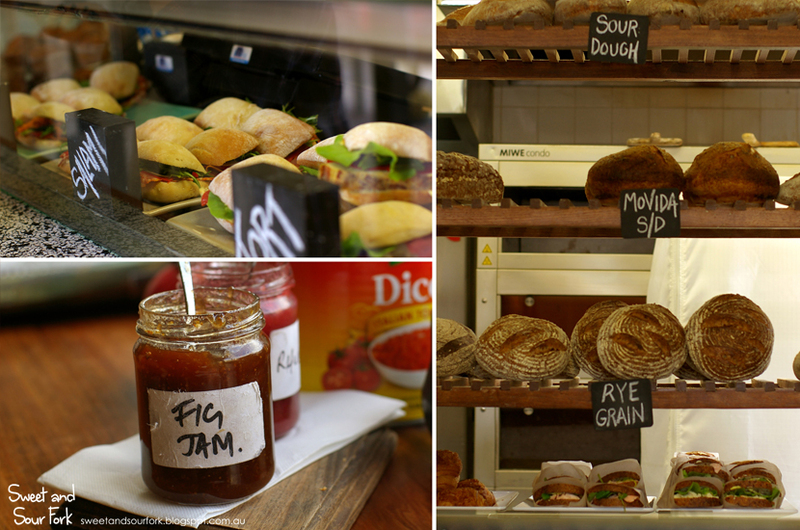 MoVida Bakery is a nice little wedge of the MoVida experience out in the suburbs. I am quite jealous of those who live within walking distance; not only are they able to stroll in for a round of sourdough any time of the day, they can also take regular advantage of MoVida’s take away dinners. Our meal came to a total of $22.5, which is on the pricey side, but justified given the quality and freshness. All in all, I’m fairly impressed with MoVida Bakery, though it would be nice if they started serving their donuts warm. Rating: 13.5/20 – warm those donuts! Seeing as Burch & Purchese Sweet Studio was just around the corner, it didn’t take much to convince Chris to agree to peek in. He did however made me promise that I won’t take any photos, knowing that I could easily spend an hour in there, so you’ll just have to make do with the ones I took last time. And whilst we were there, we munched on a sample of chocolate shortbread, and I picked up a Passionfruit Meringue Cloud ($5) so Chris could try the magic for himself. The last time I had a Burch and Purchese meringue cloud, it changed my negative opinions on both strawberries and meringue in just one bite. The jagged tang of the freeze dried passionfruit scattered on top tickled the tastebuds as it melted along with the meringue, which was literally as light as a cloud. And inside the crispy, sugary shell was a sticky and gooey center that had just the slightest bit of chew before dissolving away into a tropical sugar rush. How could you not be in love? Oh they offer the Passionfruit cake to me for free when I was there! I'd better come with you next time :p Was it good?